The Hipshot SuperTone bass bridges retrofit both pre-1973 two-point and subsequent three-point bridges. So what new has been brought to the original 40yr-old Gibson designs? Up until 1973 Gibson's bass bridges were fairly primitive and somewhat fault-prone but still relatively advanced in comparison to those in use by Fender. The introduction of their "three-point" bridge eliminated most of the existing problems of older bar or "two-point" bridges but introduced many of its own quirks. 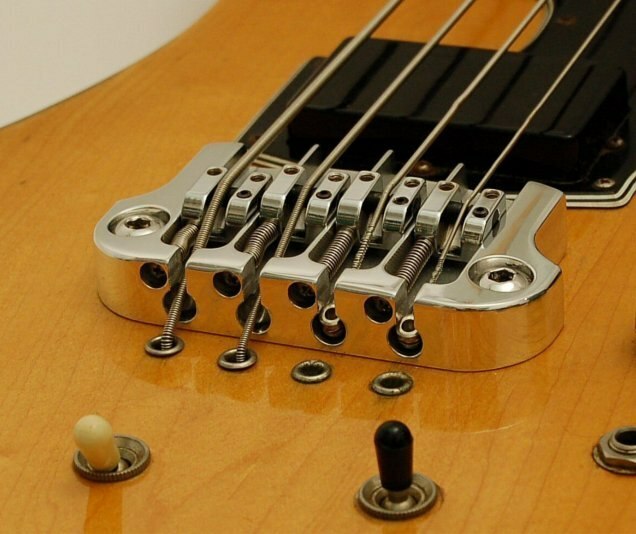 Still in use on modern Gibson and Epiphone basses, the three-point bass bridge is a proven design albeit mired in its traditional roots with much room for improvement. Up until the introduction of the SuperTone, upgrades for Gibson basses were near non-existent. The wide mounting point footprint, obligatory Gibson neck angle and modifications required to accept a new unit complicated the issue. More often than not any of these would leave the instrument devalued and impossible to restore to original spec. Hipshot certainly need little introduction to even the least experienced instrument modifier or builder. Their extensive history in producing premium hardware and drop-in retrofit upgrades makes them a regular byword and a go-to company. Hipshot are based in a substantial manufacturing facility located in Interlaken, NY which allows virtually all stages of production from material stock to boxed item to be carried out under one roof. As would be expected of dedicated retrofit items, Hipshot's SuperTone bridges match original mounting patterns for both two-point and three-point instruments. Simply removing the existing parts and dropping in the new unit is as complicated as fitment gets. By using the original mounting point locations and in-situ studs, owners of vintage instruments can confidently maintain 100% of the instrument's value by being able to return to stock invisibly. Common weak points with the original Gibson designs include two-point bridges bending forward under string pressure, saddles/intonation screws falling out three-point bridges, intonation difficulty and primitive adjustability. As is a common theme with Hipshot bridges, the SuperTone provides comprehensive independent adjustability in all dimensions with components sprung or tensioned against the bridge. SuperTone bridges are CNC milled from solid metal stock, in this case high grade Aluminium. This produces a tough, lightweight bridge with high tolerances and fantastic finishing in comparison to the rough variability of cast parts. Edges and corners are milled smooth with no seams, sharp or fragile areas. 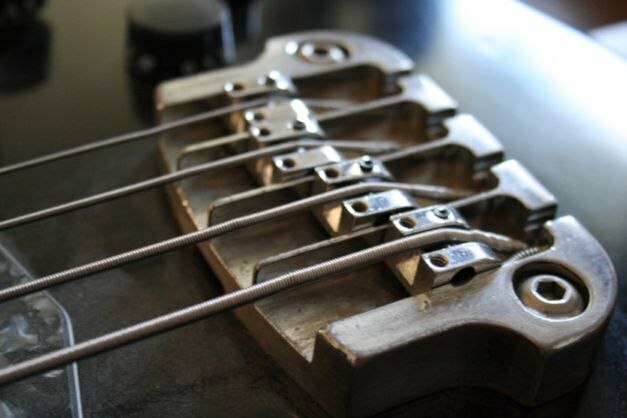 Saddle keyways share much of their design with the established Hipshot A-style bass bridges. Each keyway consists of a milled slot housing a large independently-adjustable saddle block which is itself milled from solid stock. Adjustment is possible in all three dimensions to dial in specific string geometries. The rear of the bridge is slotted allowing either bridge string capture or through-body stringing if the instrument has that option. Saddles possess grooved barrels instead of sharper notched string witness points virtually eliminating string breakage at this point. With the original bridges the saddles were fixed in height and radius or were compromised of a fixed "bar" witness point. This required that the entire unit be raised or lowered via the bridge posts. Primarily this restriction meant that instrument setups were coarse and a balance of compromises in setup geometry. Less noticeably the arrangement of some bridges - such as the three-point - also produced a weaker bridge-to-body coupling due to reliance on string tension holding the otherwise-loose bridge in place to the posts. The SuperTones lock down tight to the body of the instrument via two finish-matched mounting bolts producing the best coupling possible whilst the independent saddles a capacious level of intonation and geometry adjustment not previously feasible. Access to intonation adjustment screws is via the rear of the bridge. The screws are Phillips type in comparison to the slotted types of the original which prevents the problem of flat-bladed drivers slipping and scratching the instrument. The popular Hipshot saddle design is individually adjustable in height with ~1/3" (~8mm) of range via two hex set screws. The saddle barrels themselves can be unlocked via the third set screw with provision of side-to-side adjustment in a range of ~1/8" (~3mm) depending on string gauge. Whilst not designed for massively altering string spread, it does allow string spacing to be adjusted should the player want to take into account favourable string-to-string/equal centre spacings. As a retrofit item, the SuperTone admirably solves the shortcomings of the original bridges and introduces adjustment capabilities not previously possible. Although visually quite different to the originals, the appearance maintains a blend of both refreshing modernity and classic automotive age looks which are as pleasing on a new Thunderbird as on a 70s EB-0. All adjustment tools (other than a Phillips screwdriver for intonation) are provided along with two sets of mounting bolts to match both the Imperial and Metric threads. Setup is a breeze and free of frustration due to the excellent accessibility of all adjustment components even when strung up. From the standpoint of a custom luthier, the SuperTone bridges present interesting design options for different visual ideas to the norm. The intrinsic "Gibson nature" of the bridge requires a little forethought for correct instrument geometry however. A slight neck angle to maintain low body-to-neck join height or a small recessed footprint may be necessary. The substantial mass of the bridge lends a muscular design point which many bass designs would benefit from. As with most Hipshot's hardware it is difficult to find negative points to say about them. Their customer services guys know the value of listening to customers and apply this directly into the products without the huge inertia found with large corporations. Hipshot's email support before and after purchase is definitely key to their loyal customer base. With Hipshot carrying everything from design, manufacture and sales under one roof they definitely have the capacity to perfect their products as is demonstrated in items like the Supertone. If I were forced to hunt for negative points purely to provide balance for the huge number of positives, I would perhaps suggest adding a pad for the underside of the bridge to cushion the baseplate from pressing into soft or fragile finishes when locked down flat to the body. I can see this more being an issue for owners of vintage instruments. Most of the basses that these bridges are designed for command prices well into four figures therefore protecting the finish of investment quality instruments is important in maintaining the value of a bass that still works for a living. I also found that adding a pair of nylon washers underneath the heads of the mounting bolts was beneficial in helping keep them secure against loosening and preventing overtightening. The final twist of beyond "finger tight" snugs the heads secure. It should perhaps be noted that long-term use in exposure to direct sunlight may leave a light shadow underneath the bridge as the finish fades or reacts to UV. 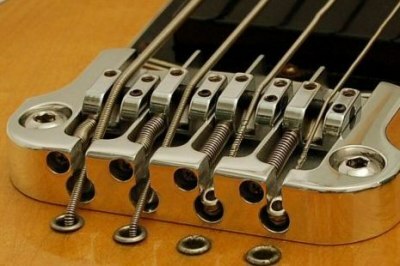 Overall I am surprised that new Gibson basses are not coming with this hardware as standard or at the very least as an option. If I came into possession of a stock Gibson Thunderbird (circa USD$1500?) with the original three-point bridge I wouldn't hesitate to upgrade it with this simple USD$120 bridge. Whilst it may sound and play well straight out of the box, without a doubt the addition of a Supertone puts it into a completely different league of instrument on both counts. In closing, the Supertone is a quality piece of hardware from a respected company that transforms Gibson basses into hugely adjustable, fuller-sounding and most importantly better-playing basses. For the builder these bridges offer a classy option for custom designs. I'm already itching to get one of the two-point Supertones into a future instrument. The three-point model installed here was acid fumed to add forty years of road hell; the modern styling certainly does not look out of place with a little antiqued mojo!